The lighter side of the "Heroic Age" of Antarctic exploration is celebrated in a new CD of polar songs, sketches and poems that has been compiled by descendants of some of the early explorers. Roger Wilson The aim is to raise money for the ship Discovery that Captain Scott first sailed into Antarctica 100 years ago and for the original huts on the continent, which are badly in need of restoration. 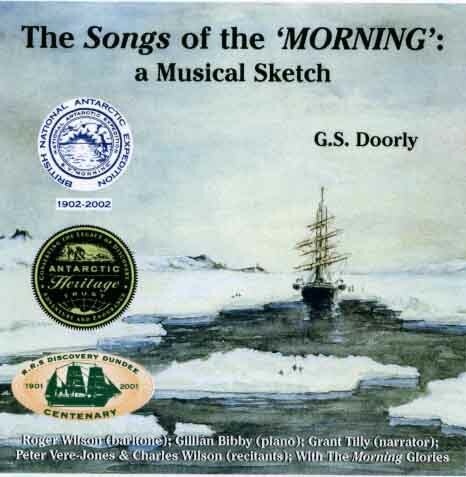 It is called The Songs Of The Morning and is based on the home-made entertainment devised by officers on the relief ship, The Morning, which sailed from London to Antarctica in search of Discovery when it became stuck in the ice on the British National Antarctic Expedition (1902-1904). Gerard Doorly, third officer on the ship, was an accomplished pianist and improviser and his notes and diaries are used to tell the story of the search for Discovery. One of the highlights is a song he penned jointly with Ernest Shackleton, who was suffering so badly from scurvy that he was invalided back to New Zealand on The Morning, on Scott's orders. According to Doorly, he proved to be "a delightful" passenger who "entered into the spirit and fun of our little mess". Roger Wilson, grandson of Doorly and a professional singer based in New Zealand, features on many of the songs and concedes the songs might not be to everyone's taste today: "Great music it isn't. But they're quite catchy and very evocative of the era. "They're the sort of things you might expect to find in a Victorian drawing room. All the officers on the ship performed. This was the great age of the gentleman amateur. "The Morning will come to the aid of Discovery again"
"Any educated person was expected to turn their hand to a bit of verse and singing a little song around the piano." The CD was produced in collaboration with Dr David Wilson, great nephew of Edward Wilson, the doctor and naturalist with Scott on Discovery. He says: "It shows the most fascinating insights into the lives of men aboard the ships. The lighter side of expedition life is generally passed over by historians who are more interested in psychological analysis of the participants than their everyday experiences. Stewart Brymer "We thought it would throw a new light on things for people who are interested today." He described the performances as "Gilbert and Sullivan with a dash of sea salt and leaning into some Noel Coward as well", adding: "Some of the puns and jokes are really quite funny, but some are groan-worthy. "But when you go down to the Antarctic and you're in this isolated environment, your standards for what keeps you amused drop a little bit, so you have to forgive them some of the more awful puns. But it's certainly very amusing." The piano, the centrepiece of much of the entertainment, was a gift from Sir Clements Markham, president of the Royal Geographical Society. It was destined for the Ward Room, but was too large for the doorway and had to be cut into pieces with the cook's meat saw and reassembled below deck. Proceeds from sales of the CD will be split between Antarctic causes in the UK and New Zealand. In dock at Dundee in Scotland, the ship Discovery is afloat and open to visitors, but is expensive to maintain and badly in need of funds. "It's hard to believe that 100 years ago it embarked on what was the first major scientific expedition to Antarctica and that 100 years ago it was stuck in the ice in McMurdo Sound," says Stewart Brymer, of the Dundee Heritage Trust. "But we need to tell more people outside Scotland about the work of Discovery and its significance. "What Discovery does now is transport the visitor back 100 years in a very interactive and educational way, in the hope that it will keep going the spirit that spawned the expedition in the late 19th Century and led to so many great things in the years that followed." But a shortage of funding means that several posts have been lost at Discovery Point and important work on the ship is not being carried out. The Trust is short of �50,000 - �75,000 annually. "To the untrained eye, the ship looks in very good condition, but there's a whole range of work requiring to be done," says Mr Brymer. "If it's not done now, we're just storing up problems for the future and in 10 years' time, we'll have an even bigger repair to do or be faced with the possibility that we would have to place Discovery in dry dock". Funds from the CD will also go towards restoring the original huts in Antarctica, which are undergoing major repair works being carried out by the New Zealand Antarctica Heritage Trust.